A BN observer said, “Sure Win Meh? Why isn’t he as confident as saying Sarawak and Sabah will lose 30 seats together for Pakatan to form the next Federal Government? Alas, he too knows that BN in East Malaysia have kept our eyes open and ears on the ground listening to all the movements. Recently, the deputy minister in PM’s office Ahmad Maslan said that the Sarawak atmosphere is very devoid of flags,posters and buntings eventhough its the 13th hour already. Sarawak legislators and political parties are doing their homework and in fact can safely say BN will have at least 25 in the bag out of 31 seats. Does he need to wipe the sweat behind his neck? We can be highly critical of the way certain component parties carry out their fight in facing the GE13. They are too fears that some of the MPs after the results are known in the 4 component parties holds high probabililty of ‘short selling themselves’ to the highest bidder if the results are too close for comfort. We shall see wouldn’t we? In politics nothing is a sure thing nor are all ‘promises” kept in totality. Many observers are pinpointing now to the Global Witness video footage which many “unkind” words were uttered and it will tip some votes over to the opposition. Latest ground reports are that thousand of discs are being burnt and translated into Iban and making their way to longhouses and riverine settlements. Under this circumstances all the reports on the ground needs to be addressed and looked over again cautiously to pick the mosts ‘winnable” candidate. However the Ugly Truth will be too hurtful for many to swallow. We start of with SUPP a multi racial party but dominated heavily with membership from the chinese community and 6 out of 7 SUPP Parliamentary areas are in the urban areas. We are of course not experts but we can be very critical as we have worked with their members. Oh No..!! I see arrows and daggers coming my way. Forgive my humble analysis but its going to hurt some people nevertheless. One would also ask did we take into considerations the voting strengths,the voters gender breakdown and get the feedbacks from the AJKs and groundzero.? Read on and tell us where we might just miss out..
Having said the above, SUPP is now paying the price for unsolved infighting which has resulted in the Chinese voting community abandoning them. It’s not that DAP or PKR have suddenly an upsurged of membership but the legislators and leaders in the party have fought so bitterly amongst themselves that they have forgotten that they are actually supposedly to fight for the people. Overall, SUPP will do well to win 4 out of 7 seats as the Chinese areas still are going all out to punish the party as their leaders have been seen to be looking after themeselves. The opposition are capitalising on the weaknesses of the SUPP party to win the seats and the infighting is not only amongst the top but it has reached also the grassroots. 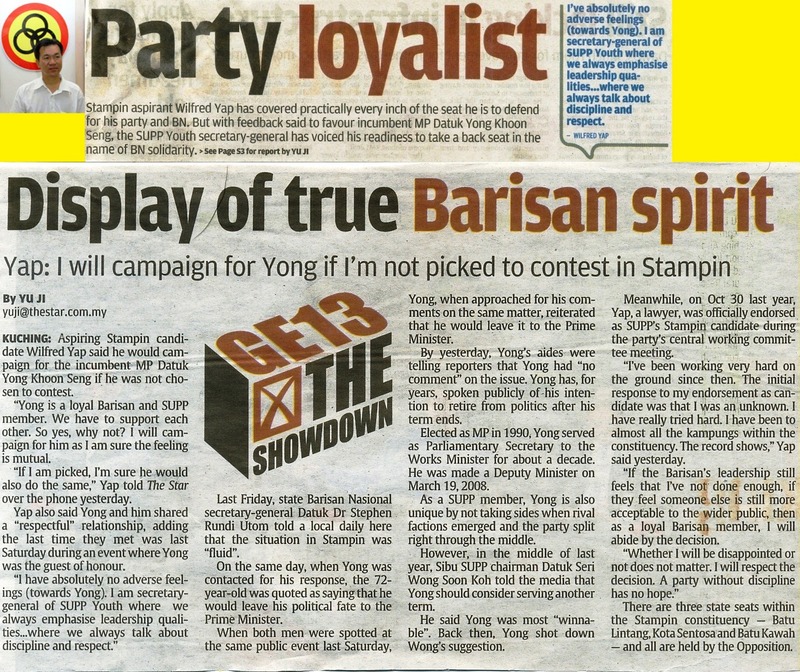 If the Team A and Team B infighting is put in the backburner the party SUPP still have a fighting chance against DAP. If not,you know the answer….! 9. Saratok:- Will the President of the party William Mawan be the chosen candidate? There are too many names being thrown around to replace incumbent Jelaing Mersat where many voters are waiting to throw him out if the party does not replace him with a credible candidate. Ali Biju the PKR candidate stands waiting to wrestle this Parliamentary seat from SPDP. 11. Baram:- Incumbent Deputy Minister Jacob Sagan will need to fight the enemy within BN who has been hellbent to topple any candidate put up by the party. There have been “recordings of speeches” and its not so much the dam factor which is affecting his candidacy. Reports are also surfacing that the name of Anyi Ngau would be an acceptable face in Baram but Jacob has been given the blessings from the party. It’s a tough fight nevertheless but Jacob would win in the final tally. Will BN change their minds to replace Jacob in the last minute? one hopes not as Ba’Kelalan state seat under the SPDP allocation fell due to last minute replacement. SPDP 4 seats are touch and go and only 1 now is heavily favoured to be retained without much fanfare. A lot of ground work and propaganda works needs to be carried out to ensure the other 3 seats remains with BN. The G5 factor will be a major hurdle for BN to solve and decisions need to be work out and carried out for the party to win the 4 seats without interference from the sacked SPDP members and their followers. A highly unpopular call must be made by the BN hierarchy. 16. Ulu Rejang:-PRS anointed candidate Wilson Ugak will take on SWP George Lagong and PKR Abun Siu. However,Billy Abit says he is very much still confident and winnable as the incumbent and will be hoping that his more than ”cordial” links with his long term association with the Federal leaders will be enough for him to be renominated. 17. Selangau:- The 13th general election, the Selangau seat is proving to be a tough battleground for its incumbent Parti Rakyat Sarawak (PRS) deputy president Joseph Entulu. He will be faced with SWP defacto leader and former MP Sng Chee Hua and PKR’s likely candidate Josuha Jabeng. 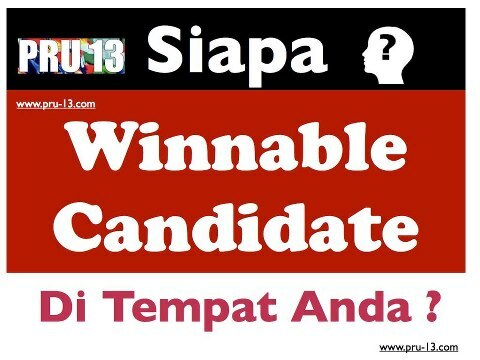 SWP and PKR are using personal issues to unseat Entulu. 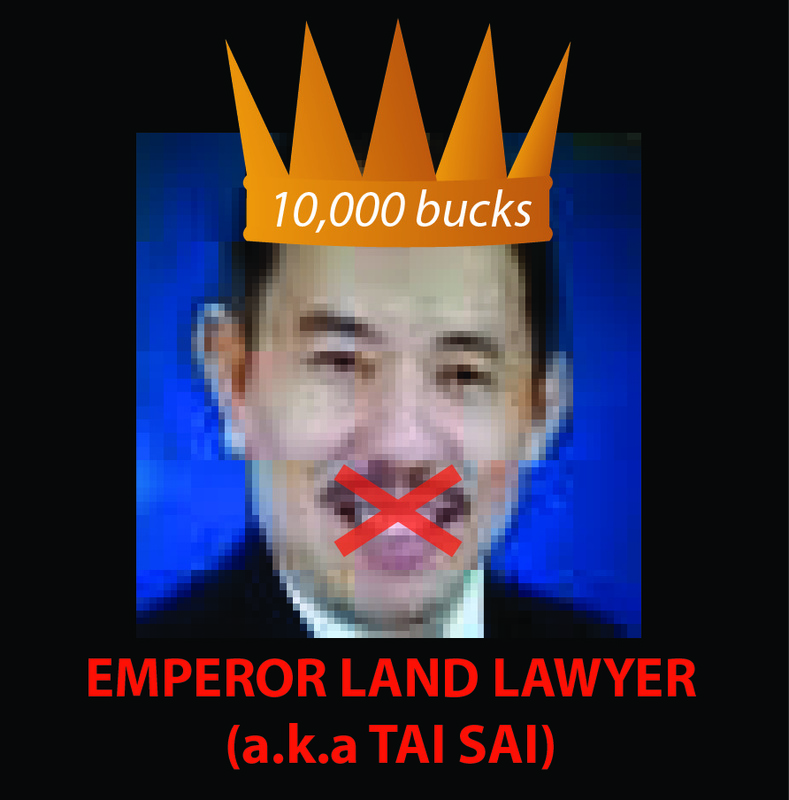 They are going round telling the voters that his “personal”intersts outweighs what is good for the Selangau are. They said Entulu had no master plan for the development of Selangau that could generate incomes despite being its elected representative for more than 20 years.Even basic amenities like clinic, schools, clean water, electricity and roads are still lacking. PRS final tally would be 5 out of 6 winnable and hard fought wins. Which seat will fall remains questionable as it will depend very much on where both SWP and PRS concentrate their machineries. 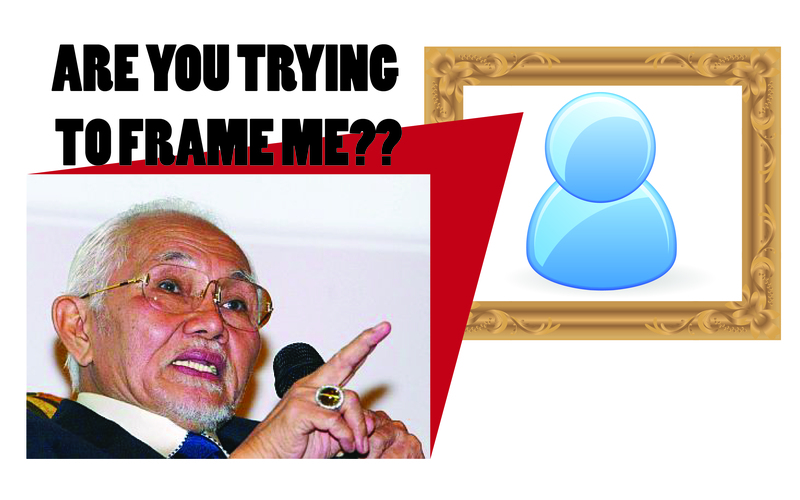 PKR would be hoping to capitalise on the weaknesses created by both SWP and PRS to steal ‘a seat” under their noses. PBB remains very united going into the GE13. There have been attempts which appeared in SarawakReport on loyalists of Taib Mahmud and Awang Tengah putting their own candidates but the party has stayed intact. Their operations room are all ready and equip with all the basic amenities required for the elections. One must never be complacent says a PBB senior leader and we know that there are some seats which will be tough. He named Limbang,Lawas,Batang Lupar and Sibuti where the candidates needs to put in the extra efforts to secure and maintain the winning streak for BN. He further commented,”Parti Pesaka Bumiputera Bersatu (PBB), the backbone of state BN, is confident of repeating its success by retaining all the 14 seats allocated to it. 28. Tanjong Manis:- Will Norah Abdul Rahman be fielded? This is a Sure win seat and anyone fielded in this constituency will face little or no resistance at all. 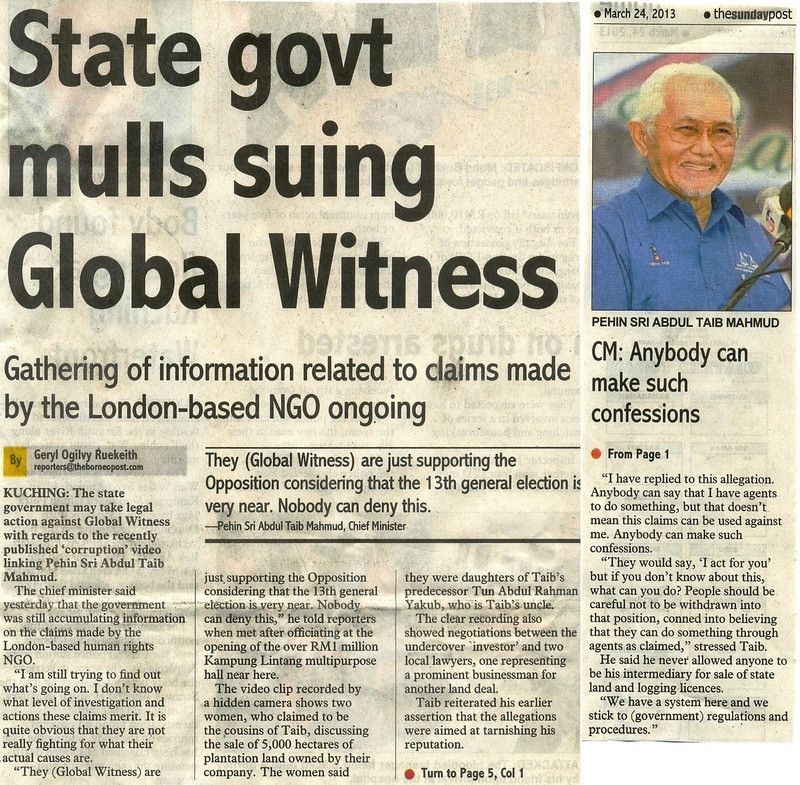 Elected unopposed in 2008 Norah must have been very angry by the timing of the Global Witness video which implicated her sisters Fatimah and Norlia in the video. 29. Batang Lupar:- ABU Rohani(anyone but you) have been used to knock out the MP who is seen to be working very hard in the constituency. In 2008 she secured 11015 against her PAS candidate Abang Eddy Allyanni who managed 2923. Her majority is so convincing that some aspiring candidates just cannot wait for her to call it a day to be named. She is presently the Deputy Minister of Domestic Trade, Cooperatives and Consumerism and many locals have found her work satisfactory to say the least. There have been many unkind reports filed to discredit her good work. Word from the Pakatan front is that PKR Sarawak SG Abang Zulkifli Abang Engkeh is the likeliest candidate to be fielded. However PAS have also made claims to the seat as they too are moving in the area. Rohani said she was prepared and ready to take on whoever the Opposition decided to field against her in the seat. PBB in the surrounding areas needs to show all their support to her instead of trying to create a wedge and hamper the election machinery. 30. Santubong:- Dewan Rakyat deputy speaker Dr Wan Junaidi Tuanku Jaafar won handsomely by 15800 in 2008 against Rahamat Idil Latip who polled 3855. According to PKR sources their candidate in GE13 would be Zulrushdi Mohamed Hol. Rumours in the Parti Pesaka Bumiputera Bersatu (PBB) circles say that Junaidi is likely to be dropped from the list of candidates for the coming parliamentary election. Will he? He is seen championing many issues of late and this could be a message to his political masters that he is still needed in Sarawak. The name of Dr Abang Draup Zamahari Abg Zen, chairman of State Housing Commission and Drahman Jaladin, PBB Deputy chief of Pantai Damai Branch have cropped up very often. Meanwhile,Wan Junaidi however expressed his confidence that he would be renominated for Santubong, proven by the support from the people from Tanjung Datu to Demak Laut. 31. Kapit:- MP Alexander Nanta won unopposed in 2004 and 2008 and if he is unopposed again in 2013 he will create a record of some sort in Sarawak. However, it seems that PKR will be fielding a candidate against him as they have identified and shorlisted two names in Edward Sumbang and Kennedy Paing. GE13 is close at hand and all political analysts from both sides of the political divide in Sarawak are waiting for the dissolution of Parliament. All political parties will want to ensure that their candidates fielded are the winnable ones and are very much accepted by the voters of the constituencies. 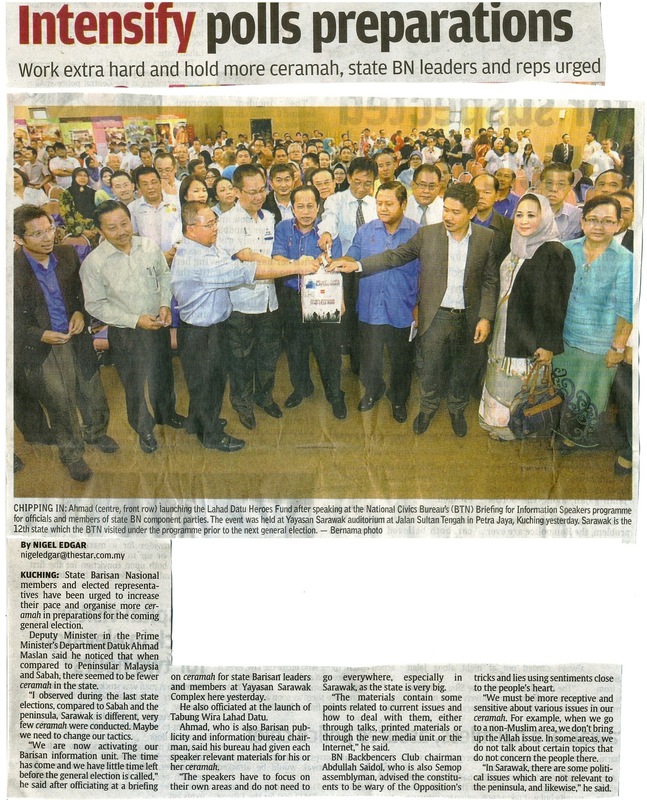 BN4 Sarawak in will have to contend with not only the Pakatan group but also SWP and many aspiring Independants. The days are numbered as to when the date of dissolution will be and the elections will have to be called not later than May 27th 2013. IS YOUR CHOICE A S.W. CANDIDATE? Is HE Also in COHORT with the Opposition? The $10000 bucks man according to insider sources have gone into hiding. WHERE IS HE..? He has spoken and many Sarawakians are angered by his names throwing and arrogant nature. Anyone can try to use CM’s name and whether its trustworthy u determine it yourself. 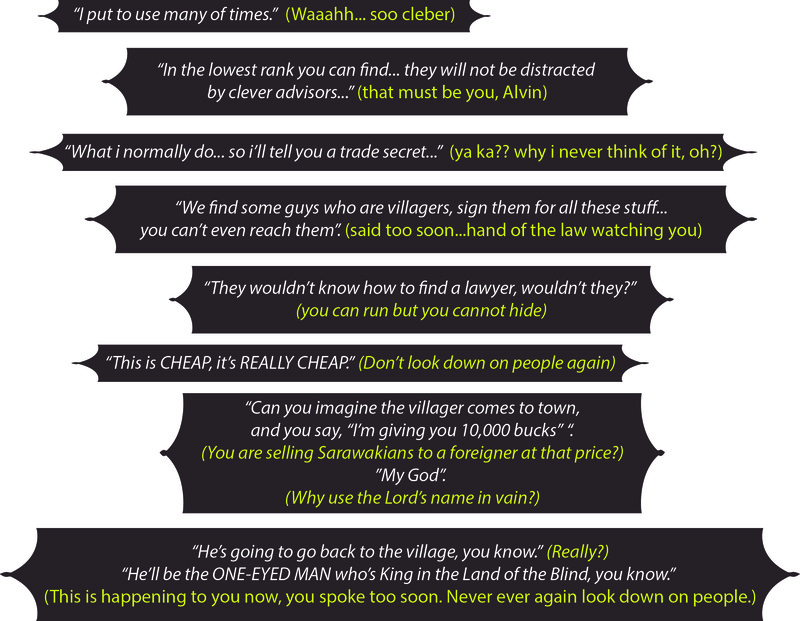 Names throwing and selling are very common. Anyone can say that,”He is my Best friend and I can see him anytime..!! Sounds Familiar, isn’t it? Reminds you of someone you know…!! Ahmad Maslan Deputy Minister in the Prime Minister’s Department have sounded the bugle and war drums in his final round before GE13. He has up the ante by rallying all BN members and elected representatives and said,”the time has come and we have little time left” and all machineries must be gelled together. BTN Datuk Raja Arif Bin Raja Ali (Ketua Pengarah) in his Crisis of Content said,”When we posts GARBAGE in obviously GARBAGE will come out. audie61 met him at the sidelines of the Cyber Activists Forum organised by BNYCT in Damansara for tea. He further reiterate that bloggers,facebookers should at all times be careful in what they posts or they will land themselves in the wrong side of the law. Earlier we tweeted on MP Kala’s opening address,”BN fights for the Nation Malaysia” while Pakatan fighting & still fighting for who is going to be PM” Obviously there were very unhappy remarks from the opposition members.